A smart pair of straight fitting mint green trousers by Fina Ejerique. They have a brown single button fastening, elasticated waist and front pockets. This white linen mix shirt by Fina Ejerique features a short button placket and band collar. These super cute mint green shorts with braces by Fina Ejerique, have front pockets, elasticated waist and detachable braces. This classic style Fina Ejerique Boys white linen shirt features a band collar and brown button fastening. This super smart white short sleeve shirt by Fina Ejerique is such a classic piece. 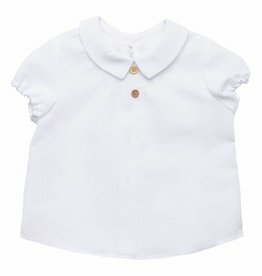 Has a small pointed flat collar, wooden button front fastening and folded cuff sleeves. 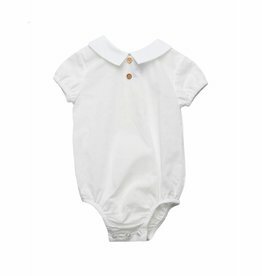 Beautiful white shirt style bodyvest by Fina Ejerique has a small pointed flat collar, elasticated sleeves, polka dot effect throughout, two decorative wooden buttons and back and crutch fastening. 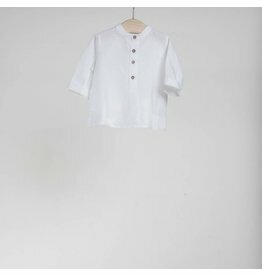 This white short sleeve shirt by Fina Ejerique has a decorative pintuck and two wooden buttons, small pointed flat collar, back fastening and gathered cuff sleeves. 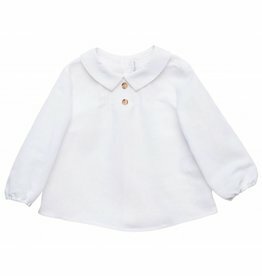 This white summer long sleeve shirt by Fina Ejerique has a decorative pintuck and two wooden buttons, small pointed flat collar, back fastening and gathered cuff sleeves.